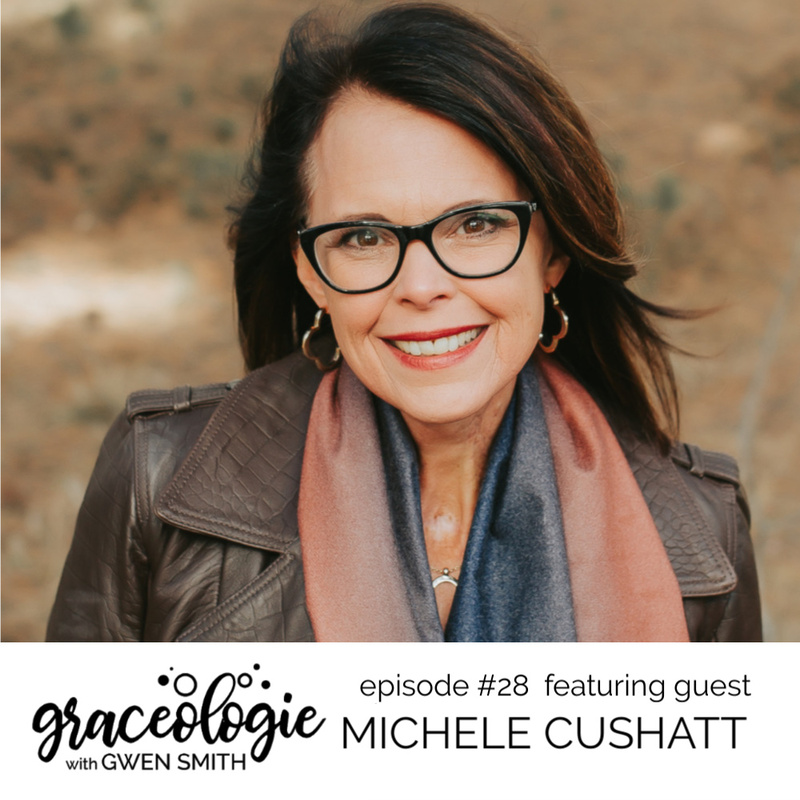 Michele Cushatt, speaker, coach, cancer survivor and author of Undone and I Am, is my guest on the new episode of Graceologie. We talk about the slippery slope of COMPARISON and how God’s view of us is ENOUGH. GWEN: Can you tell the Graceologie community a bit about your story, where you came from, and maybe some of the hurdles that you’ve had to jump to be with us today? Michele Cushatt: Okay. Well, I’m going to give you the cliff-notes version. I will say this to begin, I grew up in a home where my parents became Christians when I was just under one-year-old. So I’ve never known a time where I didn’t know Jesus. I have known God my entire life, however, I grew up with a mind-set that faith was a math equation, that the role of faith or living a life of faith was about doing all the do’s and not doing all the don’ts and if you did everything right, you would end up with a life that was good. Which worked really well for me, until I was about 21 and real life happened. And the short of it is, to begin in my 20s, I married what I thought was my first love, my first real love besides the sixth grade teacher. And he was a pastor and I became a pastor’s wife, and was doing fulltime ministry and all it took was a few weeks in this new relationship for me to realize that what reality was, it was very different from the dream. And without going into details that I don’t mind to share, I ended up 27 years old, divorced and a single mom after discovering that there was a whole secret life going on that I couldn’t. And so, what does a 27-year-old, Jesus loving girl do? A girl who had always believed in the permanence of marriage, who had always planned to do fulltime ministry, what does she do when she wakes up one day and she’s divorced, she’s a former pastor’s wife divorced and a single mom? And how do you reconcile the first 20 years of life of trying to do everything I could to follow Jesus and ending up with a life that looks so very wrong. And that really wrecked my faith for a while, because the math wasn’t adding up, the God that I believed in, the God that I had so loved and served and tried to please, didn’t come through and give me the life that I wanted. And even further, I felt like I was excluded from the Kingdom of God, that there was no way I could any kind of Christian ministry or service because I was far too broken and flawed and messed up for God to use. For a couple years, I wanted nothing to do with faith, it was such a struggle until I finally reach the day where I realize that I wanted God more than I wanted to understand. And I put to death my need to understand and explain all the things that I couldn’t unravel, and I just needed to know that God was still with me.And He met me in that place and slowly over the next year, started to rebuild my life. In the years that followed, I remarried, I married a man who had his own hard story, we became a step family with three boys. Ages, four, seven and nine, and let me just say, it is nothing like the Brady Bunch on TV. And what happened, the week before I had gone in, because I had an ulcer inside my mouth on the side of my tongue that would not heal, so he had tried some different medications and treatments, it wouldn’t go away. So on a whim, he decide to do a biopsy, and he must’ve assured me no less than the half dozen times that it was all fine. However, that Tuesday morning when he called me, he admitted he was wrong. And as it turned out, I found out that day at 39 years old, with three boys in middle school and high school that I had squamous cell carcinoma of the tongue, cancer of the tongue, which I didn’t even know existed. Having overcome so much in my life, now, I was faced with a life and death struggle. However, what happened is three and half years later, it came back, I had cancer for a second time, and then eight months after that, it came back for a third time. Much more severe and advanced than the first two times. This time, they gave me two weeks to get my affairs in order. They did a nine-hour surgery, where they removed two thirds of my tongue, which is why I talk like I do now. After giving a few weeks to recover from that surgery, they started very intense chemotherapy and external radiation, where the doctors literally said, they threw everything at me, in order to hope of saving my life. They took me to the brink of death in the hopes that I would live. So that was four years ago now, and I have spent the last four years basically trying to come back to life after almost dying, and learning how to live as a woman with a very obvious physical disability in a world that doesn’t have much tolerance for anything less than perfect. Gwen: Why do you think that is? Michele Cushatt: I don’t think we are, especially American culture, I don’t think we are very good at being uncomfortable. We have so developed a culture, the American dream, we have so developed a culture where we have at our fingertips, at any point in time the ability to numb any kind of pain and discomfort. So we have lost the ability to value and leverage pain. We don’t know how to handle discomfort, we don’t know how to deal with it. Any kind of pain, discomfort, suffering throws us for a loop. It literally unmoors us and we fall apart. So we look for the quickest thing to numb it, whether it’s food, alcohol, drugs, Netflix, social media. We look for the quickest thing, the easiest thing to grab, that numbs our discomfort. And although that makes the moment more bearable, it doesn’t make the reality of real life more bearable. In fact, we’ve basically stopped using muscles that we need to survive. GWEN: What are some of the practical things that you’ve learned or things that listeners can do today to even move themselves toward the proper respect for who God designed us to be and who He is in light of it all? Michele Cushatt: Well, to begin with, we have to honor and respect where we currently are. So when we’re hurting or we’re feeling some sort of shame or embarrassment or whatever about our imperfections and flaws, ignoring it isn’t going to make it go away. So, at some point, we need to speak out loud, This is what I’m feeling, this is what I’m experiencing. So, for me, that feeling of, I feel embarrassed, I feel a lack of value or worth because of how I talk, how I sound. I mean for goodness sakes, I’ve been training communicators for over a decade. What kind of speaker wants to hire a speaking coach that talks with a lisp? I’m always going, it’s kind of hilarious that this is what I do. So I have to sit there and acknowledge, man, today I’m feeling a lack of worth and value because of my appearance, because of my voice, because of how I sound, because of my struggles and my disabilities. Admit them, identity the feelings. Then the other thing is I have to unpack the false belief that I have bought into, that lead me here. From birth until now, we’ve been formulating an identity. We’ve been kind of coming up with criteria or standards that we have used that contribute to what we think our value and worth and identity is. We need to identify the false beliefs before we can ever replace them with truth, we need to figure out where they came from. So, go back as far as you need to. Where have the life come from? Was it something that you grew up hearing in your household? Was it something that you believed? Is it something that came from a friend group or from media whatever? What are the false beliefs? And for me the false belief was the only good communicator is an articulate, clear, perfectly speeched one, that’s a false belief. I believed that what it took to be a good communicator was great articulation. That’s what I believed. Then I challenged in with truth and I’m like, I know a lot of people who can articulate anything, but do they communicate anything of value? So, counteract that with truth, let’s counteract that with some really good solid truth. And the truth is that great communicator has more to deal with what’s on the inside than what’s on the outside. Gwen: In the video on your website you say that showing up matters. What do you mean by that and why do you think it’s important? Michele Cushatt: Well, it wasn’t easy to keep showing up with me. So when I say I was sick, I mean, you all I was on the verge, I had a feeding tube for six months giving me all my water and nourishment because I couldn’t eat or drink. I had a tracheostomy in my neck for almost two months. I had scars and burns from nose to chest. During treatment everything, I was vomiting multiple times a day for months. I looked like, I mean I lost probably 40lbs. I looked like a skeleton. Being around me and looking at me and sharing space, it wasn’t easy. It was like sitting with a corpse, I could hardly function. And it wasn’t like that for just a week, it was like that for months. And then, once my body healed, there was the emotional fallout. There was very real depression and despair and wrestling with heavy spiritual questions and all that. So, for someone who just wants to show up and have a cliché, I was not going to give that to them. There was no, go over and hang out with Michele, and let’s just quote some scripture and sing some worship songs and be happy. It wasn’t like that. So the people who allowed it to be messy and trusted that God would lead me through, and trusted that I would get through, and just loved me for who I was, where I was, as ugly and hard as it was, those were the people who made a huge difference. They allowed it to be anything, but neat and tidy. I will never get over the fact that you chose to give up the perfection of heaven to embrace the imperfection of a human life. You were perfect in every way and yet your body wasn’t, you were flesh and blood. You experienced pain, you experienced discomfort and heartache and sadness and suffering. You experienced circumstances that you knew shouldn’t have been that way, that you knew could be different. And you walked with us in this place. Jesus, I am so grateful for your willingness to enter into the full human experience, so that way we would know we are not alone in ours. God, I pray for the other person on the other end of this podcast today who really feels swallowed up by impossible circumstances. They are stuck in the dark and they don’t know how any good could possibly come from their story right now. And God, I just ask with all of my heart, that you would be a bright light in their dark, that you would help them to see that they are not alone, that you are with them, that you would somehow in some way tangibly show your presence to them and give them a vision, a perspective of what you can do with this impossibility, a little way that you can take this horrible pain and bring some kind of hope and good to life in spite of it. God, I just pray, with all of my heart that you give hope where there is none and presence where there is aloneness and healing where there is a wound, like only you can.